Bike shop and manufacturer of bicycles, with production beginning in 1981. The story of Cicli Basso is really the story of a family with a tradition of cycling. The father, a farmer and part-time public servant, was an ardent fan in a time when bike racing was still the national sport in Italy, and had even raced as a youth. It is even today an integral part of the social fabric of the province Veneto in northern Italy in which Cicli Basso is located. So it was only natural his three sons, Marino, Renato and Alcide, would continue the tradition. 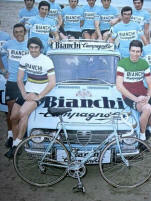 Marino was born in 1945 and began racing in 1960 with the bicycle he "requisitioned" from his younger brother Renato. He was noted early as a gifted athlete and impressed the local fans from the very beginning with his combativeness, his desire to win and, above all, his sprint. He moved quickly to the very top amateur level and turned professional in 1965 becoming one of Europe's most feared road sprinters. 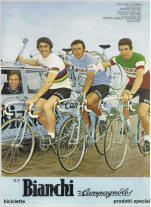 As a professional he raced with the greats of the day such as Merckx and Gimondi. Between 1965 and 1978, when he retired, he won 82 national and international races, including many stages of the Tour of Italy and, the high point of his career, the world championship road race in 1972 in Gap, France. The finish of this race, typical of his style, will remain unforgettable to the spectators because of the suddenness with which he reacted in the last 20 meters and beat and outsmarted the other contenders including Guimard who alone had pulled the small group (with Marino in the rear of course) up to the failing Bitossi. The amazed expression on his face and his half-raised arms show that he himself couldn't entirely grasp his good fortune. After retiring at 33, he lent his experience to the young company which his 2 brothers had just created. From him stems the basic concept of Cicli Basso to offer the public the same traditional tool that the professional riders use. The second brother, Renato, was born in 1947. 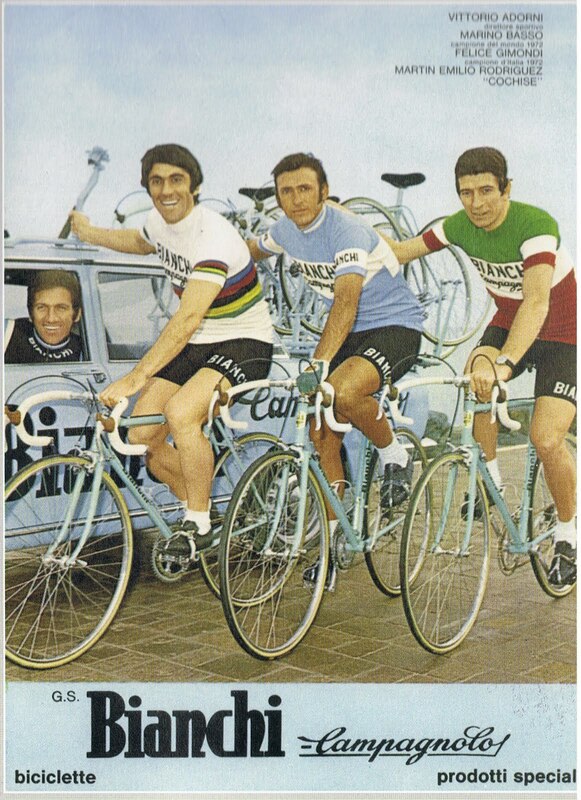 Unlike his two brothers, Renato was not drawn to race bicycles. He was, of course, a cycling fan as is almost anyone from the Veneto, but his greatest interests were in his schooling and in intellectual pursuits. He graduated from the University of Tubingen in Germany in 1974 with a degree in philosophy and political science and did postgraduate work in philosophy at the University of Padua. He is now the financial director of Cicli Basso and of other manufacturing companies in the area of Vicenza. Alcide Basso was born in 1954. Being the youngest of three, he had to pretty much fend for himself, since the two older brothers were already embarked an demanding paths when it came time for him to get a share of the pie. So he literally gave himself a professional education by, from his earliest youth onward, hanging around bike shops of master artisans. Today this solid practical foundation is one of his main strengths. He finished technical school at 19 and immediately set up a frame-building shop in the garage of his parent's home. He was also a good enough racer to absolve his military obligation in an army cycling unit. But his main skill was mechanical. While still a teenager he started as a mechanic with his brother's teams and later continued this until Marino's retirement. This brought Alcide all over Europe to the classics in Belgium, the Tour de France, not to mention all the races in Italy. 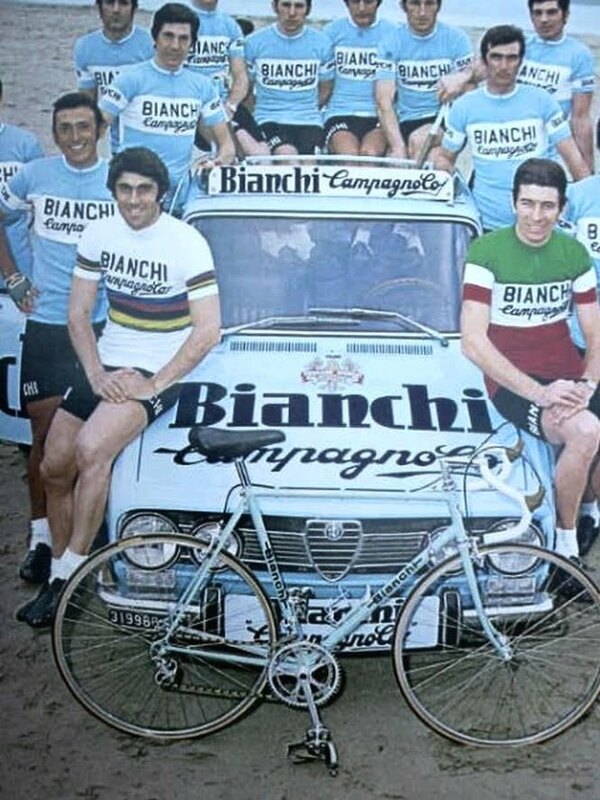 He thus worked for such teams as Salvarani, Bianchi, Magniflex and Selle Royal-Inoxpran and with such champions as Gimondi, Adorni, Mike Neel, Bertoglio and Battaglin. In 1976 he opened a retail store, in 1979 he displayed for the first time at the Milan show, and in December 1981 he opened the present factory. 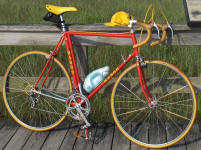 This is also when Cicli Basso began to export, primarily to Germany thanks to Renato. Throughout this time and even up to today, Alcide has constantly strived to combine practical experience in all aspects of cycling with research into the behavior of metals. To this end he collaborates with engineers at the Universities of Padua and Graz (Austria) and with local steel companies and testing laboratories. In an extremely short time hr_ has become one of the world's leading manufacturers of racing bicycles, primarily by not resting on the natural Italian advantage in this field. Today the company's major markets are Germany, the USA, Austria, Switzerland, and Sweden. Recently dynamic importers have been found for France, England, and Benelux (Jan Janssen!). This story illustrates how far drive and ambition can bring a person even from modest origins. It runs in the family.